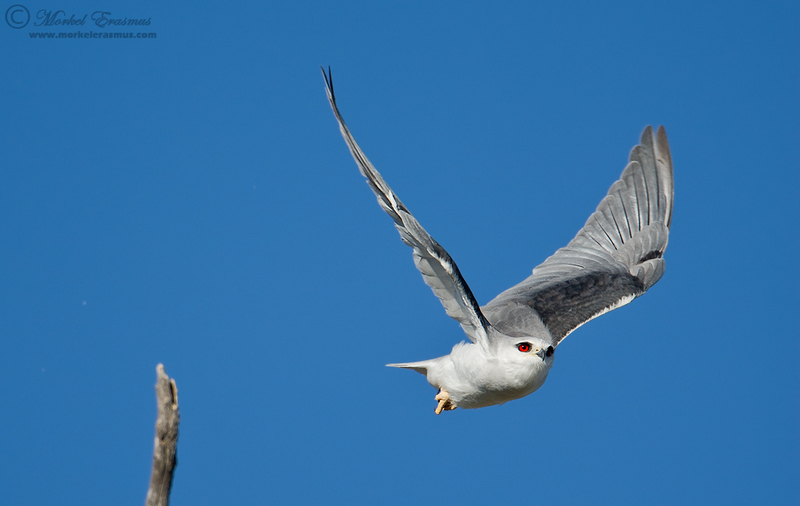 One of the most common raptors to be sighted all over Southern Africa is the Black-shouldered Kite. They are often seen sitting on telephone poles and fence lines in the countryside, or hovering over grasslands as they scan for prey. I have seen them very close to urban areas on a number of occasions too. This photo was taken in the Kalahari desert, though. I was sitting patiently, watching this perched kite through my viewfinder, and waiting for the moment when it would alight from its perch and fly off. I was happy that the bird decided to do so before I disintegrated in the searing heat, and that it flew in my direction. By using a fast shutter speed, I was able to freeze the moment nicely and capture a couple of tack sharp frames of the take-off. I hope you all have a wonderfully festive New Year's celebration! Be safe, and remember to clock in here shortly after New Year's Day as I will be revealing my "Best of 2013" blog post (which has become somewhat of a tradition on my blog) - you can view last year's selection HERE.